Lovely County was created on October 13, 1827, from Crawford County and the Lovely Purchase. The Northwest portion of Arkansas was an important area of growth from 1827 when the territorial legislature created the county, which was much larger than Lovely's purchase. Lovely County included more of present day Oklahoma than present day Arkansas. The Oklahoma portion was lost to Arkansas in 1828 with the Cherokee Treaty of that year. Most of the remainder became Washington County on October 27, 1828, and the county officials were directed to "take over the affairs and moneys of Lovely County." Created and abolished because of treaties, Lovely County in Arkansas Territory existed for only a year. While hostilities played a part in the county’s creation, an 1828 change in the western boundary of Arkansas Territory led to its quick demise. Many Native American tribes inhabited the land that became Lovely County. The Osage hunted the hills and fished in the streams and rivers until 1808, when their claims were given up in the Treaty of Fort Clark. The Cherokee traded their land east of the Mississippi River for land in the west in 1809. President Thomas Jefferson offered the Cherokee the former Osage hunting ground in the area between the Arkansas and White rivers in exchange for their land in the East. Lovely’s intended buffer zone failed. In 1817, a large Cherokee war party attacked an Osage village while the warriors were hunting. Peace between the two tribes finally occurred as a result of the arrival of soldiers at Belle Point who began building Fort Smith (Sebastian County), and the arrival from the east of Cherokee leader John Jolly. Jolly met with Major William Bradford at Fort Smith to discuss peace with the Osage. The Treaty of 1818 ended the disagreement. The treaty, orchestrated by William Clark, the territory’s superintendent of Indian affairs and governor of Missouri Territory, gave the Cherokee the land known as Lovely’s Purchase. The name became official as it honored the first buyer of the land. 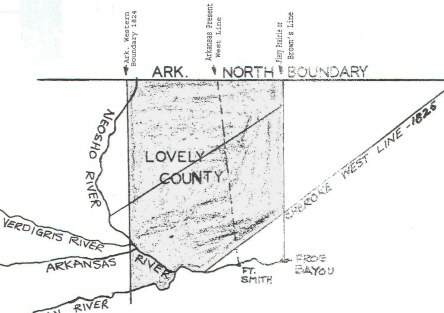 Lovely’s Purchase included part of the northwest corner of Arkansas Territory and extended to the Verdigris River in Indian Territory. The area was intended to give the Cherokee the opening to the West that President James Monroe had promised. White settlers were ordered out of the area. Persis Lovely, “who is to remain where she lives during life,” according to the Treaty of 1817, was the only white settler allowed to stay. Unhappy with the white settlement on the land they had been promised, the Cherokee protested. Secretary of War John C. Calhoun worked out a compromise. A new survey was ordered. 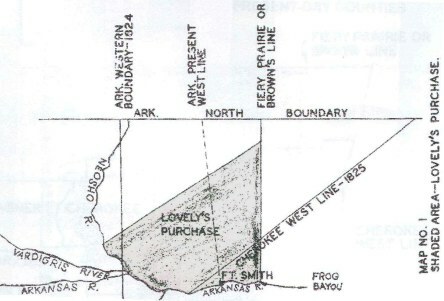 It cut off a triangular section that consisted of about 200 square miles and would result in Arkansas Territory’s loss of a large part of Lovely’s Purchase. White settlers would be restricted from settling the land. White settlers, newspapers, and politicians protested. The dispute over boundaries and white settlement continued into the term of Governor George Izard. Determined to keep all of Lovely County open to white settlement, Governor Izard sent a letter to the secretary of war on January 28, 1826. Izard suggested the removal of the Cherokee to land not appropriated by the government. The area would provide the Cherokee with the outlet to the West that Monroe had promised. Izard mentioned the possibility of opposition but suggested it would be by the “Whites and half-casts of the Tribe” because many of the Indians had left. In 1828, a Cherokee delegation went to Washington DC. The result was the Treaty of 1828, made on May 6 and proclaimed on May 28. The treaty, negotiated by Secretary of War James Barbour, gave both sides part of Lovely’s Purchase. The Cherokee gained a permanent home, as the document stipulated that no state or territory would overtake their land. An acknowledgment was made that the Cherokee were “relinquishing valuable saline.” They were to be compensated for improvements they had made and agreed to be off the land in fourteen months. Each Cherokee would be given a good rifle, a blanket, a kettle, and five pounds of tobacco when he signed up to move. The treaty also established the western boundary of Arkansas Territory from the corner of Missouri to Fort Smith. Another agreement said white settlers would be removed from the land, leading to protests from many settlers. A meeting was held to discuss the loss of most of Lovely County to the Cherokee. Attendees decided to send a letter of protest to the president and ask other counties for help in fighting the loss of homes, salt springs, and other minerals believed to be in the area. Newspapers editorialized, echoing the concerns of the citizens regarding the loss of Lovely’s Purchase. The October 14, 1828, issue of the Arkansas Gazette reported that a bill had been passed abolishing Lovely County. The county was abolished since the final boundary change placed most of the county in Indian Territory, leaving only a small portion in Arkansas Territory. The largest part of what remained of the county was included in the creation of Washington County. The completion of the survey of the new Cherokee line was announced on January 13, 1829. Acting Governor Robert Crittenden ordered settlers to move. An announcement was made that any of the territory’s land offices would accept documentation, so emigrants packed up and left. Many streamed into Washington and Crawford counties. Extensions for providing documentation were made a year at a time until a final extension of five years was granted, ending all legal claims to Lovely County. 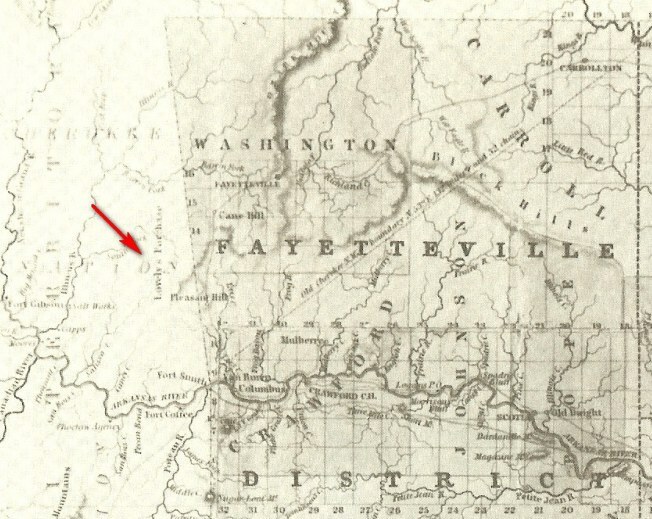 WASHINGTON COUNTY – The controversy between white settlers and Cherokees in the northwest part of the Arkansas Territory was resolved last month, October of 1828, by an act of the Territorial Legislature. The settlement involves the elimination of Lovely County and the creation of Washington County. The background of the dispute has been long and complicated. During the 1820’s, as settlement of the northwestern part of Arkansas Territory grew, more and more white people wanted to move into the land known as Lovely’s Purchase, between Arkansas and the Indian Territories. In 1827 the Arkansas Territorial Legislature took firm action to allow white settlement. They created what was known as Lovely County, which included almost all of Lovely’s Purchase, and much more land to the north and west besides. The Cherokees were so unhappy over the possibility of losing their hunting land to white farmers, they sent a delegation to Washington to protest. The secretary of War, James Barbour, began working out a settlement. In 1828 a treaty was signed in which a new dividing line between Arkansas territory and the Indian Territory was recognized. All Cherokees in Arkansas Territory were required to move to Indian Territory, leaving Arkansas free for white settlement. The agreement pleased most Cherokees and white settlers, even though the majority of Lovely’s Purchase land is now in Indian Territory. On October 27, 1828, the Arkansas Territorial Legislature met and voted to “extinguish” Lovely County, which was not quite a year old. The remaining Lovely’s Purchase and Lovely County land in Arkansas was incorporated into a new territorial county. Washington, with borders on Missouri to the north, Izard and Independence counties to the east, and Crawford County to the south. Lovely County was created in 1827 by the Arkansas Territorial Legislature. The county included most of a large purchase of land, in present-day northwest Arkansas and northeast Oklahoma, made by Indian agent William Lovely in 1816. The county seat was Nicksville, near the present location of Tahlequah. In 1828 the western border of Arkansas was moved to its present location, and a special session of the Arkansas Territorial Legislature "extinguished" Lovely County and incorporated its Arkansas lands into Washington County. Nicksville, Lovely County, Arkansas, was established April 25, 1828, with John Dillard as first postmaster. The office was discontinued October 2, 1829. The buildings at Nicksville were subsequently acquired by Dwight Mission located near where is now Marble City, Sequoyah County. From 1824 to 1828 this part of Oklahoma was included in Lovely County, Arkansas. Almost mythical because its legal papers were not available either in files or in museums, this changed in late 1966, when Mr. "Dutch" Morrows living on Ward Bluffs above the Illinois River near Watts, Adair Co., Oklahoma discovered many brown and yellowed papers scattered about near a dump. He took them to Mr. Jack Gregory, principal of Watts school, who recognized their historical value. Dr. Caldeen Gunter of Siloam Springs made a careful appraisal of the fragile papers, and contacted Gilcrease Museum in Tulsa. They were definitely interested not only in making copies but in making the copies available for interested historical societies, museums and publications. There were no printed forms for the County, so all material is handwritten. Documents and signatures of many prominent persons of that era are listed, some of the persons are: S. P. (Sam?) HOUSTON, Wm WOODRUFF, Robert CRITTENDEN, C. F. M. NOLAND, A. P. CHOUTEAU, B. L. D. BONNEVILLE, and others. Historically the inventory of papers is important in that Lovely County existed for one year only, and was carved out of Lovely's purchase, bounded on the west by the Verdigris river ands south just east of Fayetteville. Its termination was the Cherokee Treaty and subsequent, present day, Oklahoma-Arkansas boundary. Lovely County was bordered on the east by the Fiery Prarie or Brown line to the Verdigris in the west, encompassing most of present day Benton, Washington and parts of Crawford county, Arkansas; Delaware, Adair, Sequoyah, Cherokee, and Mayes counties in present day Oklahoma. By the treaty of 1828 the Cherokees exchanged the territory occupied by them, between White River and the Arkansas, for that west of the present State line, to which they were removed. This country embraced the greater part of Lovely County, which was by force of treaty abolished, and the citizens of the country removed east of the western boundary line of the State. They were indemnified from such loss, by reason of such removal, by a grant of 320 acres of land to the head of each family, to be located within the limits of the State. The first regular explorer of this portion of the State was Frank Pierce, who, about 1819, came up White River trapping and hunting. On reaching the mouth of West Fork, he ascended that stream to within two miles of Fayetteville, where he discovered a herd of buffalo. In attempting to kill one of them to get some meat for his supper, he saw a band of Indians. He lowered his gun without firing, dropped under the bank and retired for the night under the friendly shelter of a large elm. The next day he struck the waters of the Illinois, and followed that beautiful stream to its mouth, then down the Arkansas to where Lewisburgh now is, thence across to Batesville. About the year 1828 he came back and settled near the place where nine years before he had spent the night in hiding from the Indians. 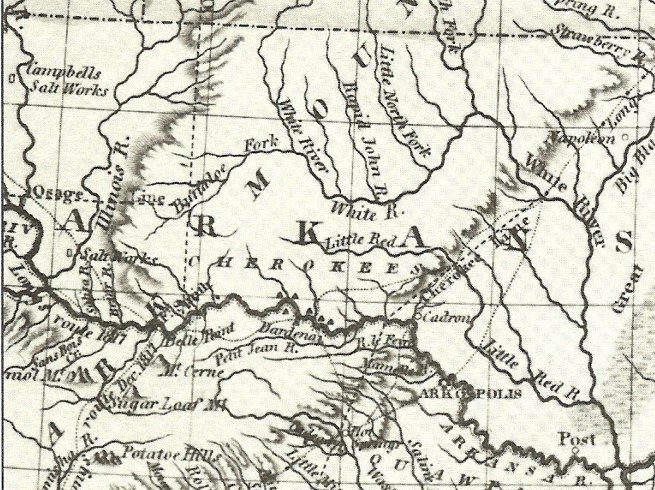 On July 9, 1816, Major William Lovely, Cherokee agent in Missouri Territory, concluded a treaty with the Osage Indians for the United States government to purchase approximately three million acres in what was to become northwest Arkansas and northeast Oklahoma. This would provide the Cherokees with undisputed hunting territory. This area became known as "Lovely's Purchase." However, Major Lovely did not have authorization to make such a treaty and the government never approved his bargain. Two years later, the government made a treaty with the Osages which embraced substantially the same terms. On October 13, 1827 the Arkansas territorial assembly created Lovely County out of part of what was then known as Crawford County. This new county was much larger than the original Lovely's Purchase. Beginning at the upper Cherokee boundary line on the north bank of the Arkansas river, thence running up and with the meanders of said river to the mouth of the Canadian fork, thence up said Canadian fork to the western limits of the territory of Arkansas, thence north with that line to the north-west corner of the territory, thence east to the south-west comer of Missouri, thence east with the line between Missouri and Arkansas, to the Fiery prairie or Brown's line, thence south with Brown's line to the Cherokee line, and thence with the Cherokee line to the place of beginning. Early in 1828, Congress set the western edge of Arkansas Territory at its present position and on October 17, 1828, the County of Lovely was extinguished and the portion remaining in Arkansas became Washington County. 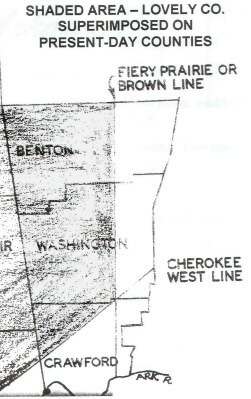 All "whites" living west of this line were ordered to move east of the line and all Cherokees living east of the line were ordered to move into Indian Territory west of the line. The Cherokees were allowed to sell any improvements on their land, if they could find a buyer. "Whites" were also allowed to sell improvements on their land, if they could find a buyer and in addition the head of each family was to be granted 320 acres (half a section) in Arkansas.